Hermann Ludwig Ferdinand von Helmholtz (August 31, 1821 – September 8, 1894) was a German physician and physicist. He contributed to many fields, including physiology, fluid dynamics, the theory of electricity and magnetism, and thermodynamics. His formulation of the principle of conservation of energy influenced a generation of physicists. He invented the ophthalmoscope, which revolutionized the field of ophthalmology; and he invented a resonator to show the strength of various tones. In his philosophy of physiology, he emphasized experience as important for the formation of perception, although he did not altogether deny pre-existing and innate categories of perception. Helmholtz was the son of the Potsdam Gymnasium headmaster, Ferdinand Helmholtz, who had studied classical philology and philosophy, and who was a close friend of the publisher and philosopher Immanuel Hermann Fichte. Helmholtz's mother, Caroline Penn, was of English extraction. As a young man, Helmholtz did not distinguish himself in his early studies, but showed a proficiency in math and science. At age 17, he expressed an interest in physics, but economic circumstances dictated his career direction as a military doctor. He studied at the medico-surgical institute in Berlin from 1838 to 1842, where he earned his degree upon acceptance of his dissertation on the nerve cells of ganglia. He remained in that city and practiced as an army surgeon, all the while continuing his studies in physics and mathematics in his spare time. His first important scientific achievement, an 1847 physics treatise on the conservation of energy, was written in the context of his medical studies and philosophical background. He discovered the principle of conservation of energy while studying muscle metabolism. He tried to demonstrate that no energy is lost in muscle movement, motivated by the implication that there were no vital forces necessary to move a muscle. In 1848, Helmholtz became assistant of the Anatomical Museum in Berlin, and teacher of anatomy at the Academy of Arts. A year later he moved to Konigsberg to assume a professorship in physiology, where he spent the next seven years. In 1849, Helmholtz married Olga von Velten. In 1851, Helmholtz revolutionized the field of ophthalmology with the invention of the ophthalmoscope; an instrument used to examine the inside of the human eye. This made him world famous overnight. Helmholtz's interests at that time were increasingly focused on the physiology of the senses. His main publication, entitled Handbuch der Physiologischen Optik (Handbook of Physiological Optics), provided empirical theories on spatial vision, color vision, and motion perception, and became the fundamental reference work in this field during the second half of the nineteenth century. His theory of accommodation went unchallenged until the final decade of the twentieth century. Helmholtz became professor of anatomy and physiology at the University of Bonn in 1856. He developed an interest in fluid dynamics and showed that movement such as that illustrated by a smoke ring would, in a frictionless fluid, continue forever. This result was expanded upon by William Thomson, who entertained the hypothesis that such rings were the basis for the existence of atoms. In 1859, Helmholtz's first wife Olga died after a long illness. They had two children. In 1859, he took a position as professor of physiology at the University of Heidelberg. In 1861, Helmholtz married again, this time to Anna von Mohl; the couple had two children. In 1863, Helmholtz published a book called On the Sensations of Tone as a Physiological Basis for the Theory of Music, once again demonstrating his interest in the physics of perception. This book influenced musicologists into the twentieth century. Helmholtz invented the Helmholtz resonator to show the strength of the various tones. In 1871, Helmholtz moved from Heidelberg to the University of Berlin where he became a professor of natural philosophy, finally fulfilling his lifelong dream of a career in physics. There he took up some of the problems of electromagnetic theory. His mathematical formulation in this field is known as Helmholtz's equation. Helholtz's student Heinrich Rudolf Hertz became famous as the first to experimentally demonstrate the existence of electromagnetic radiation, as predicted by the work of James Clerk Maxwell. Hertz's discoveries were a direct result of a challenge made to him by Helmholtz to demonstrate the existence of what Maxwell had called the displacement current in air and in empty space. In 1883 Helmholtz introduced the concept of free energy, the heat energy available to do work. This was an important advance in thermodynamics, and the concept is widely used in the subject as it is taught today. In 1887, in addition to his teaching duties in Berlin, he became director of the physicotechnical institute in Charlottenburg. His last years were devoted to an attempt to unify the sciences under the principle of least action. Helmholtz continued to work for several decades on editions of the Handbook of Physiological Optics, frequently updating his work because of his dispute with Ewald Hering who held opposite views on spatial and color vision. Helmholtz tended to rely on experience as an important input to spatial comprehension, while Hering and the so-called "nativists" emphasized the innate intuition as playing the most important role. The philosophical dispute divided the discipline of physiology during the second half of the 1800s. Students and research associates of Helmholtz at Berlin included Max Planck, Heinrich Kayser, Eugen Goldstein, Wilhelm Wien, Arthur König, Henry Augustus Rowland, A. A. Michelson, and Michael Pupin. Leo Koenigsberger, who studied at Berlin while Helmholtz was there, wrote the definitive biography of Helmholtz in 1902. The sensory physiology of Helmholtz was the basis of the work of Wilhelm Wundt, a student of Helmholtz, who is considered one of the founders of experimental psychology. He, more explicitly than Helmholtz, described his research as a form of empirical philosophy and as a study of the mind as something separate. Helmholtz had, in his early critique of the speculative early nineteenth century tradition of Naturphilosophie, stressed the importance of materialism, and was focusing more on the unity of "mind" and body. Helmholtz in front of Humboldt University in Berlin. Helmholtz extended a theory originally proposed by Thomas Young that the human eye detects and is sensitive to only three primary colors. Helmholtz proposed that each of these three colors has a particular type of receptor in the eye that detects it. Helmholtz's treatise on the principle of the conservation of energy was widely read and, in spite of his medical background, influenced a generation of physicists who were trying to decipher the mechanism of heat and its transformations. Helmholtz continued to make major contributions to fields as diverse as physiology, applied mathematics, electromagnetic theory, and thermodynamics. His work, particularly in the philosophy and physiology of perception, continued to exert an influence on scientists through the twentieth century. Of his contribution to hydrodynamics (fluid flow), James Clerk Maxwell said: "...he establishes principles...which have escaped the penetrative power of all the mathematicians who preceded him, including (Joseph Louis) Lagrange himself" (Maxwell, 2003). Helmholtz put great stock in the importance of meeting the best minds of his time. "When one finds himself in contact with a man of the first order," Helmholtz wrote, "the entire scale of one's intellectual conceptions is modified for life. Contact with such a man is perhaps the most interesting thing life may have to offer" (Maxwell, 2003). ↑ The usage of terms such as work, force, energy, and power in the eighteenth and nineteenth centuries by scientific workers does not necessarily reflect the standardized modern usage. Cahan, David. 1993. Hermann von Helmholtz and the Foundations of Nineteenth-Century Science. Berkeley: University of California Press. Koenigsberger, Leo. 1906. Hermann von Helmholtz. Tr. Frances Alice Welby. Oxford: Clarendon Press. O'Connor, John J.; Edmund F. Robertson "Hermann von Helmholtz". MacTutor History of Mathematics archive. On the Conservation of Force Introduction to a Series of Lectures Delivered at Carlsruhe in the Winter of 1862–1863, English translation. Biography and bibliography in the Virtual Laboratory of the Max Planck Institute for the History of Science. 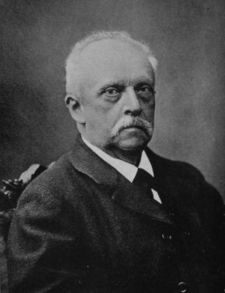 History of "Hermann von Helmholtz"
This page was last modified on 22 December 2017, at 20:04.